Hello friends! I have been buying a good bit of makeup lately, and I wanted to give you an overview of what I’ve been loving. I might go into more detail later and do full reviews on some of these, but for now let’s just take a look at some of my new faves. First, we have the N07 Stay Perfect foundation in the shade Warm Ivory. I picked up this foundation a few weeks ago after picking up a bit of a tan in Belize. This cost $15.99, and has up to 17 hours of wear. I’ve been using this basically every day, even after my tan died back down. It reminds me a lot of the Too Faced Born This Way foundation, which I unfortunately dropped and shattered a couple months ago. 😦 That was my favorite foundation ever! This is $23 cheaper though, so I’m quite happy with that. 🙂 I also love that it works so well with my oily skin, and doesn’t clog my pores even though it contains sunscreen. Whenever I use the MAC Mineralize foundation which has sunscreen, I end up getting cystic acne. So I’m really happy to finally find a foundation with SPF that actually works for me. And I’m definitely going to need it in this intense Florida sun! Next, we have the NYX Tame & Frame Brow Pomade. I bought this after realizing that I had been using my Benefit Ka-Brow for over a year. I have issues with throwing away expired makeup if it was pricey, but even I knew that I just couldn’t keep wearing it. I was literally getting eyebrow pimples. Ew. Anyways, switching to this was absolutely amazing. The quality of my Ka-Brow kept decreasing as it was getting older and older, so having a new pomade was like a breath of fresh air. It is beautifully pigmented, blends out so well, and the tiniest bit goes a long way! And it’s only $6.99, so definitely budget friendly. In the pic below, I am wearing the pomade topped with a brow gel from IT cosmetics. I can’t say I noticed a huge plumping effect on my lips. If there is, it’s subtle. My lips definitely didn’t feel tingly like they do after wearing other lip plumping glosses, but that may be because these lack the harsh ingredients found in other products. However, this is a great gloss. It’s a deep red with a slight berry tone, and it moisturizes my lips really well. Plus, it isn’t sticky – which is something I hate in lip glosses. Another cool feature about this gloss is that the inside of the cap lights up, and the back of the bottle has a little mirror. That way, you can apply it anywhere and on the go! Even though this product was gifted to me, all opinions are my own. Next, we have the Milani Amore Matte Metallic Lip Creme in the shades Chromatic Addict, Prismattic Touch, and Cinematic Kiss. These were $7.99 each, and THEY ARE GORGEOUS. Prismattic Touch and Chromatic Addict are super opaque, extremely metallic, and transfer-proof. 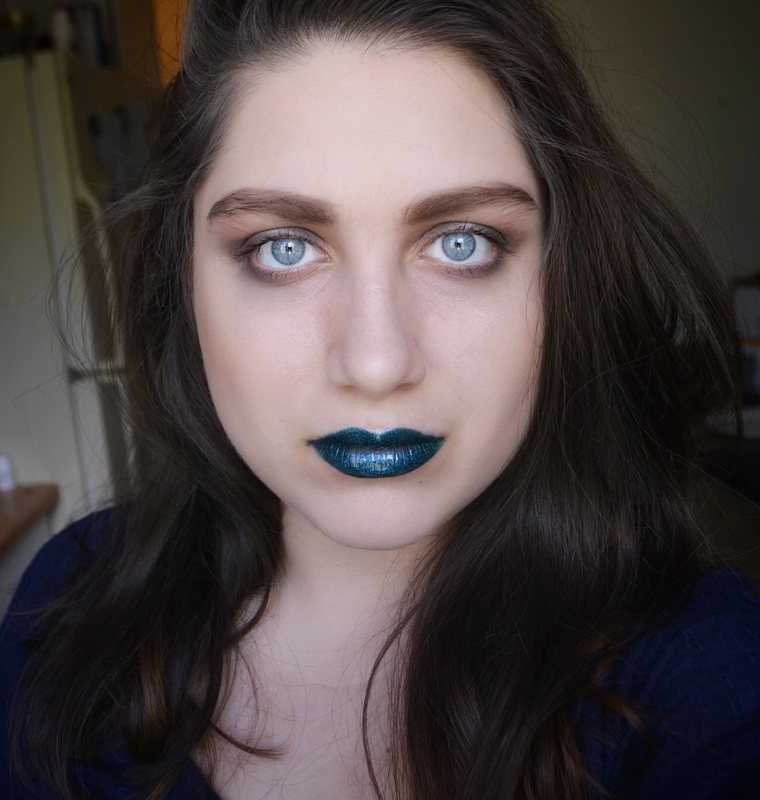 Cinematic Kiss is a tiny bit patchy and not as metallic, so I probably wouldn’t buy that shade again. But I have been living for the other two. And last but not least, I have Totally Baked Eyeshadow from Medusa’s Makeup in the shade Tubular. I recieved that in my Medusa’s Makeup subscription box, which I will be reviewing in a few days. This little baby retails for $9, and is a beautiful blue-green shimmer shade. On the website, it looks mostly green – but in real life, it is more blue. However, I actually prefer the way it looks in person! I have to be careful when I apply it, because I have blue eyes. A lot of people think you can’t wear blue eyeshadow with blue eyes because it will wash out your eye color; this is sometimes true, but you can work around it. Anyways, I absolutely love the high pigmented shimmer that this product gives! Thanks for the read! I love it because it’s a really sneaky way to check on your lips while out to eat. I used to use my phone screen reflection, and I looked like a total dummy. I LOVE Milani. I don’t think I’ve encountered any products of theirs that have disappointed me. 🙂 Great haul! The brow pomade looks really nice! Thank you! I’m so glad I finally tossed my old Ka-Brow. Thank you so much! I’ve just read through about 10 of your blog posts lol; I love your site! Wow thank you that just made my day 🙂 but your blog is awesome too!